Sapere aude! Have the courage to know! is therefore the motto of the Enlightenment. 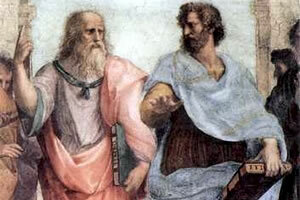 "It is clear, Socrates, that the soul is like the divine, and the body like the mortal. ... it is the mind which sets in order and causes everything"
Guided by the Word, as Freud indicates, strictly speaking psychoanalysis is a cure through love. This is a seminar in the authentic sense of the word. A group partaking in study and open to every person professing a deep interest in the real thing psychology. Understanding, for such is our goal, with a good commitment to work out the mind, set as it is in quest of truth from the beginning. Meaning thus we resource our understanding tracing all idea in context, from the wisdom of Socrates to its ultimate formulations in the teaching of Lacan and beyond; guided in our steps through the labyrinth of ideas by the immortal poet Jorge Luis Borges. Nota Bene: The seminar runs by groups of 4 to 8 persons reunited for this purpose. The meetings are held online through free video-conference technology. A seminar could also run in a particular location where participants want to attend in person. Workshops are available for health and for educational or for human resources professionals who may want to examine a particular problem or a working praxis. Each workshop woulb be tailored to create a propitious dynamic to examine in depth the questions risen by the situations and practical issues being treated or encountered in the everyday praxis. Therefore, each group would develop an specific program of studies to respond to their real needs. Available in a "one to one" basis for health and educational professions or any person professionally responsible for other human beings. Direct Care is a methodology based in clear clinical concepts, which enables NHS practitioners to grant immediate access to health services of the highest quality. Direct Care has already demonstrated that you can successfully resolve the bureaucratic syndrome of waiting lists in any public service were this methodology would be learned and adopted. It is particularly effective for improving clinical performance in outpatient services. If you are managing a NHS service and want to get rid of chronic waiting lists whilst learning to multiply the clinical efficiency of your team in order to grant immediate access to health services, your are welcome to contact us for advice or to arrange a training course matching the needs of your service.